In 1903 two young brothers, Allan and Malcolm Loughead moved to Alma Bridge Road in the little mountain town of Alma with their mother. At that time, Alma was a vacation resort along the train route from San Francisco to Santa Cruz. The old El Camino Real of 1791 passed below the bluff. Farms and Orchards dotted the countryside. Flora Haines Loughead purchased a 35-acre ranch known as “Cathedral Oaks” and relocated with her sons after divorcing John Loughhead. She had been a reporter with the San Francisco Chronicle and she supported her sons by freelance writing and growing fruit. Allan and Malcolm tinkered in the barn. while maintaining the farm equipment. Allen fascinated by automobiles, built a speedy racecar. He loved racing, but after hearing about the Wright Brothers dreamed of being able to fly. By 1907 only seven men in America had flown powered planes and Allen was determined to join their ranks. Allan’s half brother Victor wrote “Vehicles of the Air” in 1910, so Allen took off for Chicago to find his brother. He worked his way across county racing cars and got a job with a Chicago biplane firm. After flying solo he was hooked. first plane they had built. On June 15, 1913 the maiden flight lasted 15 minutes. It was the first biplane with an engine in the front. It had one propeller driven by a Kirkham six cylinder water-cooled engine. They built a seaplane because of the availability of large water areas for take-offs and landings. It had an upper wingspan of 46’ while the lower wingspan was 10’ shorter with a 30’ fuselage. Weighing in at 2200 pounds it could carry a load of 584 pounds, while seating two passengers and a pilot. It cruised at 51 miles per hour, with a top speed of 63 miles per hour. Allen and Malcolm got their big break at the Panama-Pacific Exposition in 1915. Their biplane became the sensation when they gave over 600 passengers 10 minute flights for $10 dollars each. 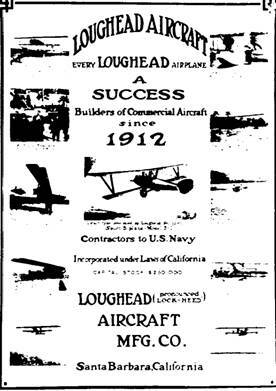 With their newfound success, they moved to Santa Barbara and formed the Loughhead Aircraft Manufacturing Company in 1916. The Loughhead F-1 Flying Boat made its maiden flight in 1918 and the Loughhead Brothers made their first military sale to the United States Navy of Curtiss HS-2L flying boats. Unique single shell wooden construction enabled their planes to fly faster than their competitor’s fabric covered biplane designs. “The Vega” made of plywood, was the fastest commercial airplane in the world. First flown in 1927, it carried Sir Hubert Wilkens over the North Pole. Records were set in it by Amelia Earhart, Frank Hawks, Art Goebel. Captain C.B.C. Collyer, Willey Post, Harold Getty, and Charles Lindbergh. Somewhere along the line, the brothers started using the name ”Lockheed” because of the cumbersome problems with their Scottish surname. In February of 1934, they finally legally changed their name to “Lockheed”. twin-engine monoplane of its time. At this point, Malcolm left to concentrate on development of the hydraulic brake system. He refined his original design for what was to become the four wheel hydraulic brake that is the standard for the automotive industry. This was a project he had long dreamed about. The prototype had been built in the barn on their ranch in Alma. The Lockheed Brothers continued to design planes until their deaths, Malcolm in 1958 and Allen in 1969. They were the most successful pioneers in their field. Flora Loughhead remarried to David A. Gutierrez, sold Cathedral Oaks in 1910 to nationally renowned artists George Dennison and Frank Ingerson. In 1954, 7.65 acres were taken by the Santa Clara Valley Water Conservation District to be flooded as part of the new dam project at Lexington. In 1988 the land was purchased by the Midpeninsula Regional Open Space District. At that time, the barn was still standing. The barn colapsed in the 1989 earthquake and was demolished.